When I shared about my six-year-old son Cooter giving me the honor of naming me the “Meanest Person in the World,” I mentioned that he might not have school and learning as a top priority. He’s very bright and he loves learning new things–about Star Wars, animals, the world. Because of an episode of Andy Griffith (the one where Barney tries to marry Andy off), he really wants us to read The Legend of Sleepy Hollow. I mean, he really wants us to…..as in he keeps asking me so many questions about it that I pretty much have our favorite used bookstore and the library on our agenda for tomorrow. However, when it comes to phonics and math, he will do what he needs to, most of the time, but it just isn’t his thing. And yesterday I gave thanks for that. We were riding over to Mess Cat and Leroy’s house yesterday afternoon, and I went a different route. After I had already committed to it, I clenched my teeth and looked in the rear view mirror. I usually avoid going that way, but I let my guard down and was trying to go the quickest way I could. My glance backwards showed my two littles entranced by the episode of Andy Griffith where Aunt Bee got into the “elixir” and was singing and playing “Toot Toot Tootsie, Goodbye” on the piano with all she had. I was thankful. They didn’t see the sign. The sign for the club that we passed yesterday. I’m not writing this to make a commentary on the people who work there or the people who go there. I am writing because I struggle with what I will say when, as will inevitably happen, one of my littles asks me what that word means, and what kind of dances they are doing, and why do people have to pay $5 for them? That. I dread it. Tonight we were going to meet Mess Cat and Leroy across town. As we neared the movie theater where our favorite coffee shop is, something on the marquee caught my eye. Yeah, not even worth your time in checking it out. Just my opinion, but yeah. Who is making these movies anymore? Again, I was thankful that my littles were distracted. I did NOT want to have to answer what that might mean. We make weekly trips up to Macon, and I have planned my route for a long time based on the location of a billboard that asks the question of where the reader will spend eternity. It bothers me, as did the one before it that warned of one of the seven “deadly sins.” I want to explain religion and spirituality to my children in my own way. I’d rather not have to do it because one of my children is afraid of what will happen to them because of what it says on a billboard. When it was first put up, I would try to distract my reader by asking a question or pointing out something in the opposite direction. I am thankful in those moments that she is easily distracted, and we can get past such things without her reading them and wondering what they mean. But most of the time, I tried to avoid that route. So yes, Cooter can’t read well yet. His sister was a late bloomer as well, so I’m not worried about it much. She reads like a fiend now, zooming through her books as fast as she can, and she loves to read. He’ll get there one day too. But I am glad that he can’t read well yet. He watches things and people a lot more than she does. So I know when he does start reading well, I will have lots and lots of questions to answer. I think I’m going to stop feeling guilty about and apologizing that my vehicle has a built-in DVD player. I may be a little freer in letting them play their electronic games as we ride around from point A to point B. I’m done. I am happy for anything that will keep their minds innocent a little longer, and for a little while longer keep them from asking me the hard questions that I know are coming. When they do come, I will answer the best way I can, but until then, bring on the Gilligan’s Island and Leave it to Beaver and Andy Griffith. I’ll take those over a bad Grandpa any day. 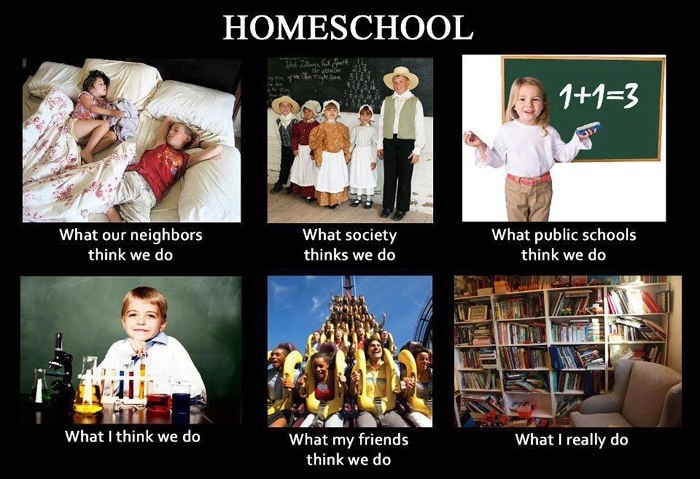 Yeah, okay, now that I’ve cleared that up, the “What I do” one really cracks me up, especially this one about homeschooling. Hi, I’m a homeschool Mama, and only one, well okay, two of these may be accurate. Don’t ask me which ones. We have an example of the “What I do,” or rather “What I see” meme going on around here. I was watching my middle one riding her bike up and down our dead-end street the other day. She was so happy and free riding along. It’s one of her favorite things to do. She was so proud the day she learned to ride her bike on her own. Only it’s not her bike. Exactly. This is my daughters’ bike. 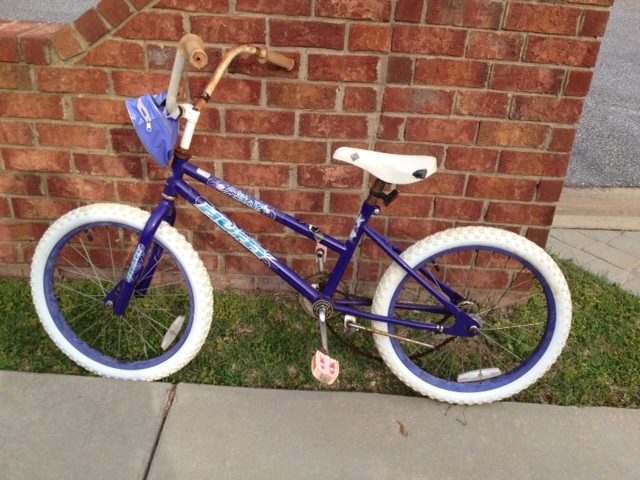 My daughters’ bike–about twelve years old. Many a happy mile has been ridden with this one. That was not a typo. It belongs to both my daughters. 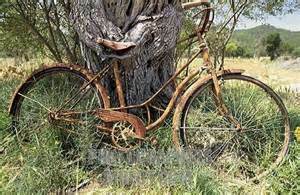 It was my oldest daughter’s bike, a gift about twelve years ago, from my great aunt. 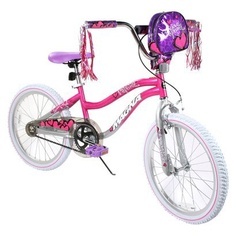 She was like a grandmother to me, and she delighted in getting this bike for my girl for her birthday. I can remember how happy Aub was riding it. Mama and Daddy would load Aub and the bike up and go down to see my aunt, letting her walk along while my oldest rode it on her paved driveway. Fast forward about ten years. Daddy knew that our Princess had outgrown her little bike with the training wheels. He remembered he had kept this bike out in his building all those years, and he told me he thought it was time. It was bittersweet as he was the one to teach Aub to ride how to ride without training wheels all those years ago…..on this bicycle. The lymphoma had taken away his ability to teach this granddaughter, but not his desire to have her learn. So we got the bicycle out, brushed the dust off, and brought it home. And that was the beginning of the shared love of this bicycle. As I watched our little butterfly fly up and down the street on her bike, I thought about her bike and the fact that she LOVES it. The rust and oldness of it do not bother her at all. In fact, I think this is how she sees it. Of course, as I look around at our plethora of “interesting” things in the yard, on the porch, and so forth, I am afraid that this might be how some folks around here see her bike. But not this girl. Oh, how I love her vision! We say she’s our sunshine, only sometimes we have to wear sunglasses. Things like a little rust or old pedals don’t slow her down. Tonight I am thankful for this child who dresses herself in what we would call mismatched colors and patterns but still looks beautiful, who sings and dances and asks us to sit for her performances, and who giggles when we ask for autographs. I love how she sees this world. I adore that the bike she is riding is made all the more precious to her because it belonged to her sister. This child who loves animals and cannot stand to see anyone have their feelings hurt, this child of mine will have her own hard time of it in this world. But this I know, her sentimental heart and sweet smile and special way of seeing things has shed light into many a dark day, and I am thankful that she is just who she is. This is a real princess, not OURS. 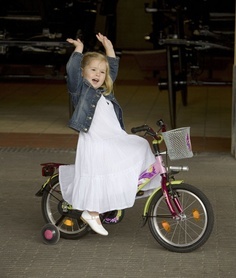 Princess Amalia, Dutch heir, riding HER bicycle. But I am sure our girl sees herself as a princess riding her beautiful bicycle.